Today, Hudson Group, the largest travel retailer in North America, announced the grand opening of the newly renovated United Nations Gift Centre in the heart of Midtown Manhattan. Located in the recently refurbished General Assembly Building at the United Nations Headquarters, the gift centre now spans an impressive 2,597 square feet. Hudson Group first began operating the United Nations Gift Centre in 1997. The modernized space, devoted to fine gifts and memorabilia of the world-famous United Nations, has just concluded its 18-month-long renovation to enhance the overall customer experience and to offer curated collections of merchandise for the more than 1 million people who visit the landmark each year. The state-of-the-art design complements the original look-and-feel of the United Nations with a modern, more vibrant twist. The new United Nations Gift Centre offers merchandise from over 193 member nations and its staff speak 26 languages, from Arabic and Hindi, to French and Spanish. Much of the shop’s collection is designed exclusively for the United Nations Gift Centre, and includes beautiful jewelry, apparel, confections, decorative and gift items. 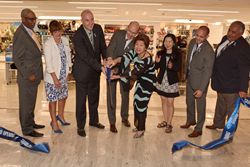 Hudson Group celebrated the grand opening at a private ribbon-cutting ceremony in the UN Visitor Centre on July 19. The United Nations Gift Centre is open 7 days a week, from 9:00 a.m. until 6:00 p.m. Monday-Friday, and 10:00 a.m. until 5:30 p.m. on weekends. Visitors may also browse a wide selection of gifts on the United Nations Gift Centre’s website http://ungiftcentre.com/. The United Nations Gift Centre is another extension of Hudson Group’s deep ties to New York. The company began as Hudson News with its first store in LaGuardia Airport. Since then, Hudson Group has expanded to over 950 locations across North America, with more than 100 locations in New York City. Additionally, in 2015, the company donated more than $142,000 to nonprofit and community organizations in the city's five boroughs, including the USO. The United Nations is an international organization founded in 1945 which currently has 193 Member States. The United Nations works to maintain international peace and security, promote sustainable development, protect human rights, and uphold international law. The UN provides a forum for its members to express their views in the General Assembly, the Security Council, and other committees. This enables governments to solve international problems together. The UN's Chief Administrative Officer is the Secretary-General.